Landlocked Switzerland is widely considered to be one of the most scenic and beautiful countries in continental Europe, featuring a wide array of geographical landmarks including mountain ranges, lakes and valleys. For those looking to combine natural wonders with cosmopolitan delights, RV rental, campervan hire or motorhome rental in Switzerland lets you enjoy the best of both worlds. Campervan hire in Switzerland offers the most affordable option to budget-conscious travellers who want to have their creature comforts on the go. Switzerland, due in large part to banking behemoth Zurich and a concentration of global headquarters located in Geneva, receives a constant stream of executive travellers with expense accounts, so it is a bit more on the top end as a tourist destination even by European standards. The country is geographically divided by the Alps, the sub-alpine mountain range of Jura and the Swiss Plateau, the last of which is home to the majority of the population and the largest cities. Take your Switzerland campervan rental from Zurich Airport and follow the lead of the Swiss Plateau bisected by a network of excellent surface roads. 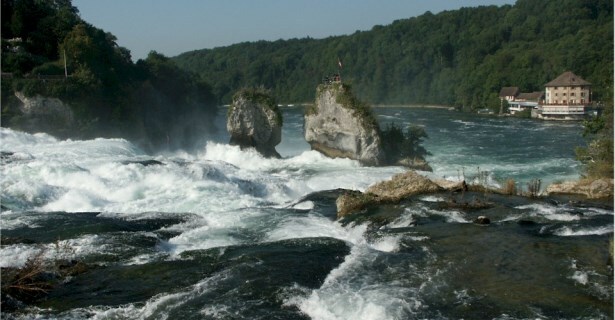 You won’t have to drive far from Zurich, the largest city, to glimpse Switzerland’s natural bounties: Less than an hour north in your camper rental in Switzerland tumbles the largest plain waterfalls in Europe, the Rhine Falls. Just a couple of hours south of the capital, Berne, lies the vineyards of Lavaux on the shores of Lake Geneva. This route will bring you to other economically and culturally important cities of Switzerland including Lausanne and the picturesque Lake Lucerne where you can hop on a scenic boat cruise. The most popular months for tourist travel by motorhome rental in Switzerland occur during the middle of the year, typically between May and September. Thanks to a relatively mild climate, those travelling by Switzerland motorhome hire will be able to fully enjoy their outdoor experience. The relatively small geographical size of Switzerland enables travel to and from campervan rental locations and popular tourist attractions relatively quickly. Outside of the cities dispersed throughout Switzerland are the majestic peaks of Swiss Alps, the most famous of which is the Matterhorn in the south near the border with Italy. This Italian-speaking Swiss region of Ticino lies east of the majestically carved Valais and easily accessed by campervan hire in Switzerland. The Castles of Bellinzona are the prime tourist interest in Ticino while alpine enthusiasts are more drawn to Valais’ largest glaciers, like the 14-mile long and .625-mile-thick Aletsch Glacier, and the country’s highest snow-capped peaks. Summers can be magical in this part of the Swiss Alps, and you won’t be left without options come winter. Drive your Switzerland RV rental or motorhome hire to the ski fields of Valais contained in an area designated as a UNESCO World Heritage Site, and you are assured of some of the best in the world. Switch your headlights on in day time as well as night time. On mountain roads, vehicles coming uphill have priority on those going downhill. Except if it is a bright yellow postal bus, these always have right of way. Take your time, don’t drive as fast as the locals, as they know every twist and turn. Switzerland is a great place for a motorhome rental holiday. Just take your time and follow the rules, so that you will have a safe and pleasurable vacation.